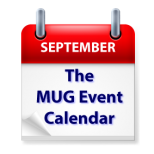 This week’s MUG Event Calendar is back up to full strength this week, even though it follows a holiday weekend in the U.S.
Adam Engst will talk to a New York group about El Capitan, Dr. Robert Carter will address a California group about upgrading OS X and iOS, a Florida group will look at RC drones, and groups everywhere will be discussing Wednesday’s Apple Event. Other topics on this week’s agenda include passwords, photo editing, backup strategies, Amazon Echo and more. Saginaw Macintosh Users Group – Bring It!